Citation Information: J Clin Invest. 2016;126(8):2799-2801. https://doi.org/10.1172/JCI89156. 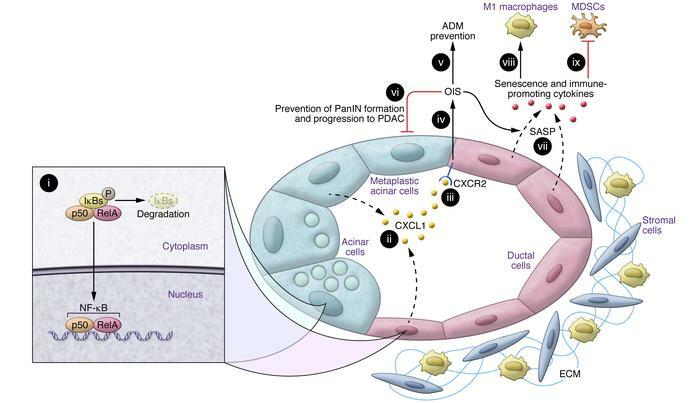 Pancreatic ductal adenocarcinoma (PDAC) is a deadly cancer in which NF-κB pathways promote biological aggressiveness. In this issue of the JCI, Lesina et al. investigated the role of RelA, the p65 partner of p50 that together form the most common NF-κB complex, in the early stages of pancreatic malignant transformation and in established PDAC. By deleting Rela in the context of an oncogenic Kras-driven autochthonous model of PDAC, the authors demonstrated that RelA is a mediator of oncogene-induced senescence (OIS) and the senescence-associated secretory phenotype (SASP) that attenuates acinar-to-ductal metaplasia, pancreatic intraepithelial neoplasia (PanIN) formation, and PanIN progression to PDAC. Loss of the tumor-suppressor function of RelA in the early stages of Kras-driven pancreatic neoplastic transformation was associated with decreased OIS and SASP and a protumorigenic tumor microenvironment that harbored more M2 macrophages and myeloid-derived suppressor cells. The beneficial effects of RelA were mediated by increased expression of CXCL1 and its activation of CXCR2. By contrast, in advanced stages of Kras-driven murine PDAC, loss of p53 or p16 was associated with senescence bypass, and RelA deficiency in this context attenuated cancer cell proliferation and prolonged mouse survival, indicating that RelA enhances tumor progression in established PDAC. RelA exerts tumor-suppressive actions during the early steps of PDAC initiation. An early pancreatic lesion, in which acinar cells are undergoing ADM and are actively forming a PanIN lesion. (i) Activated RelA translocates to the nucleus with its p50 partner, and the NF-κB complex enhances the production of CXCL1 (ii). After binding to CXCR2 (iii), CXCL1 enhances OIS (iii), which attenuates the formation of ADM lesions (v), as well as PanIN formation and progression to PDAC (vi). As a result of the induction of senescence, the ductal cells in PanIN lesions secrete multiple additional cytokines (vii) through a mechanism termed SASP. These RelA-induced changes are associated with paracrine immune–promoting actions on the tumor microenvironment, as evidenced by an increase in the number of M1 macrophages (viii) and a decrease in the number of myeloid-derived suppressor cells (MDSCs) (ix). Minimal stroma is shown for these early lesions. By contrast, in established PDAC, loss of p53 or p16/Rb pathways leads to senescence bypass, which converts RelA into a tumor promoter. ECM, extracellular matrix.